Of Dan's and my various uses of electricity, I have to say that probably the most useful ones are the refrigerator and freezer, followed by the computer. (Power tools for building and repair would be next). I do a lot of jelly and jam making throughout the summer, but being able to freeze various fruits to make jam and jelly in January and February is a blessing indeed. This works particularly well with things that I have to harvest over a period of time, such as elderberries. Over the summer I was able to pick and freeze four gallons of them. Once the holidays were behind us, there was finally time to make that jelly. Elderberries cooked down and crushed for the juice. While the juice was cooking out of the elderberries I pulled out a gallon of frozen strawberries and a gallon of frozen figs. A combination of strawberries and figs from last summer's bounty. These I cooked together to make strawberry - fig jam. Dan loves his strawberry jam but I never seem to be able to make enough. I thought I'd try the two fruits together to see what he thought. I ended up with enough elderberry juice for a canner load of half-pint jars of jelly, and enough strawberries and figs for a canner load of pints of jam. Does anyone else squeeze out the juice when making jelly? I read somewhere we aren't supposed to do that because it makes the jelly cloudy. I do it anyway because I can't stand to leave any juice in the pulp. I want it all for jelly! The other thing we aren't supposed to do is blend fruits for jam in the blender. I think the idea is to have chunks of fruit mixed in. I don't care about that either, because my fruit bits always end up at the top of the jar. I like them evenly dispersed. I suppose my jam is more of a jellied fruit puree. The last one to make is my annual mixed fruit jelly. Sand cherries and blackberries. Boy, is it red! It's last because if there's any elderberry juice left, I'll add that to the mix. This year I had a couple handfuls of sand cherries and a handful of wild blackberries. Today I'll strain and measure it. If I need more juice I'll cook down some frozen blueberries too. I think this year's batch of elder jelly was better than last year. I think that's because last year I got a fair but not abundant harvest. The competition with the birds is pretty stiff so I tended to pick them while a lot were still green. This year was more bountiful and there was plenty for everybody. Next year should be even better. So that's how I spent the last several cold, damp days. How are you faring these last days of January? Two years ago we put in our first rainwater catchment system by stacking two, 275 gallon (1000 liter) food grade totes (photos and details here). Last summer we put in a second, single 275 gal tote in a different corner of the house (about that here). Because of the sizes of their respective roof areas, the first one catches 50 gallons per inch of rain, while an inch completely fills the second! As amazing as that is, it doesn't take long to use up all the water in the tanks during a hot summer dry spell. Because of that, Dan has been hankering for a 1000 gallon tank. No local availability has been one deterrent, prices another, plus, can you imagine paying shipping on something like that? Dan was at Tractor Supply the other day for fencing materials, where he happened to have a look around. The 1550 gallon stock tank you see in the photos above immediately caught his eye. Pricing for most large tanks run about $1 to $1.50 per gallon of capacity. The price for this one was about 50¢ per gallon. Even more surprising was that the 750 gallon tanks next to it were the same price! When he inquired about that he was told, "We don't sell many of those big ones." Well, they sold one that day. It will be awhile before we can put it in. 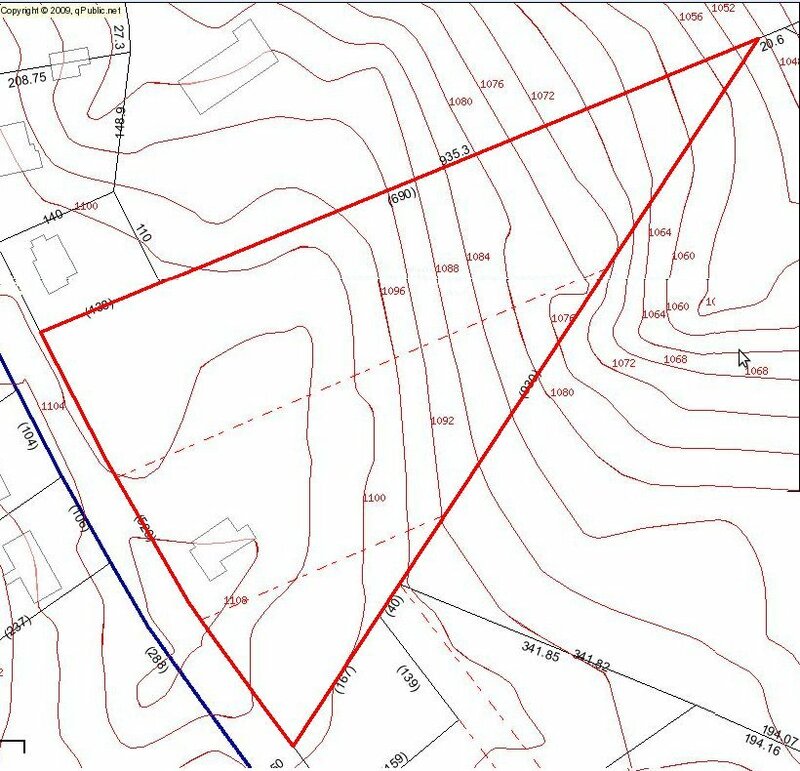 Preliminary steps will include clearing and leveling a place for it, but I'd like to get my pasture hedgerow underway first, and of course spring gardening is imminent. So much to do! 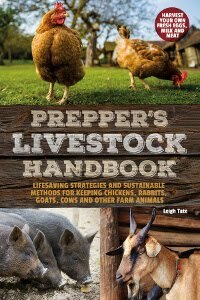 There's no excuse for being bored on a homestead. It's not that I'm terribly strong, perhaps the handle on my hatchet was just old, but I finally broke it. Just splintered off where it inserts into the hatchet head. I thought "oh no" but Dan said "no problem". He went to the firewood cutting pile, pulled out a stout hickory limb, and made me a new one. always one to wait on me while I go get the camera. He cut and shaped it, even woodburned a grip on it for me. Ready to be sharpened and put to work once again. It feels comfortable in the hand and is heavier than the old one. This is a good thing for tools, because lightweight tools and equipment require more muscle power. He could have bought a replacement handle, but we're finding that replacement handles are becoming more lightweight as well. So nice to be able to make a sturdy one from what's on hand. In his book, Growing a Farmer, Kurt Timmermeister describes his daily chores as the bookends of his day. I love this analogy and it sticks with me as a comforting way of describing my own life too. Modern culture works so hard at getting out of work, to the point where, really, I think some folks work harder at not working than if they'd just do the job in the first place. Whenever did we decide that work was bad, anyway? Our routine has evolved, so to speak, over the years. New critters certainly requires change, but we've adapted to our animals and their natures, learning to accommodate them, rather than trying to get them to accommodate us. When Dan is home we work as a team. When he's not, I stagger the chores a bit differently. The girls, ready and waiting to be fed. Chores start at the crack of dawn. We don't have electricity in our outbuildings so we try to begin as soon as we can get see outside without a flashlight. We've been up since 4 or 5, taking the time for that first cup of coffee, Bible reading, and for me, writing. The chicken coop is opened first thing to let the chickens out. We do this mostly to keep our too-many roosters from squabbling inside the coop. The chickens are fed their scratch and then I go get the goat feed ready. In winter time everyone is more demanding. If the girls aren't hollering for their breakfast I'll take the bucks a load of hay. The gate which separates the pigs from the billy boys is left closed until they've had their fill. If the gate is open, the pigs rush in and push the boys out of the way. However, it's not the hay they're looking to eat, it's the pile of dropped hay in front of the feeder. For some reason they love to burrow under this for an early morning nap. I figure they can have their nap later because the bucks need breakfast first. are particularly interested in me, they're just hoping I have something to eat. Surprise and Lily are taken to be milked in the morning. I let Surprise out first, because she knows to go right to the milking room. I give her a head start before taking Lily on a lead. If I don't, Lily will take off at a gallop to try and beat Surprise to the milking stand. I let her do this a couple of times, but it created a problem after they were milked. Lily expects Surprise to be in the pasture when she gets there. She never figured out that if she gets milked before Surprise, then she goes back to the pasture before Surprise. She then starts hollering and looking frantically for her. So much easier (and quieter) to do Surprise first, so that she's already in the pasture by the time Lily gets there. Morning milking is a lovely time of day. I can catch the sunrise if it isn't overcast and enjoy the peaceful, early morning sounds. It's one of my favorite times of the day. Lily is on the lead when I take her back to the pasture. If she isn't, she'll take off running just to see if she can steal a few bites from somewhere she's not supposed to be. As I return to the milking room I open the chicken gate into the pasture. If I open it too early, the chickens rush the goats' breakfast and I don't want them to do that. Funny how goats will rarely share their food with another goat, but will allow the chickens to help themselves. This is when I try to remember to open the gate between the bucks and pigs too. The others does are fed in the pasture. If Dan is home he's already done that, filled water buckets, and done manure duty. If he's not, I'll do a quick check of water buckets and fill those in need, or if frozen, get hot water into them as quickly as possible. After that, I take the milk into the house to strain and refrigerate. Mid-morning I go out to make rounds, check water buckets again, and fill the girls' hay feeder. Early afternoon I do a hay check and, in winter, fill hay feeders if needed. I take a quart of grain to the pigs and sprinkle it over the field they're working on. This is the field in which we plan to plant in corn and cowpeas next summer. Rather than give it to them in a feeding pan I make them work for it. That may sound tough, but the pigs love to root and hunt for food. I also figure they each get a fairer share that way, plus it keeps them busy for a long while, because after that I may go foraging for still-leafy tree branches for the goats to eat. If the pigs are around they rush the branches pushing the goats out of the way. They may eat some of the leaves, but mostly they trample them down, so it's better to occupy the pigs elsewhere. One thing I'm hoping is that grain hunting will encourage more rooting. In the late afternoon I get ready for evening feeding. All my critters think this should be at 2 p.m., but I think it should be closer to 4 (later in summer). I chop sweet potatoes, Jerusalem artichokes, greens or herbs if available, and any fruit rinds, cores, or other scraps I've saved from our meals. The pigs and chickens also get dairy and meat scraps. The pigs each get their pans topped off with a cup or two of whey, milk, and/or cooking or canning jar water I've saved. The pigs are one reason I plan to always keep a goat or two in milk all winter. Now that the hens are laying again, I beat a couple of eggs into this mixture too. When Dan's home he tosses the chickens their afternoon scratch while I feed the pigs. They know it's feeding time and have been squealing non-stop to let me know they're hungry (as if I could forget). By this time all the goats are bellyaching hollering to be fed too. The bucks are next, though, because they and the pigs only get pan fed once a day. Lastly the girls. They don't think it's fair they should have to wait until last, but I remind them they get fed in the morning too. They don't care about that, but I sympathize because I know that being pregnant and making milk is work. I'm milking once a day now, so Lily and Surprise are tied outside of the pasture at their feeders, while Helen, Daphne, and Bunny get theirs in the pasture. While I'm waiting on them I check and fill the chicken feeder, also water buckets are tended to once again. feed them separately, they'd both finish off one pan & then the other. Last rounds are made at dusk after the chickens have gone to roost. The doors to the coop are shut, as are all gates. If it's going to be very cold I'll top off hay feeders, because I know that roughage is how the goats will stay warm. This is another peaceful time of day. All the critters are settling down and I can catch a glimpse of the sunset if it's not too cloudy. The time between morning and evening chores is filled with projects. We have indoor projects and outdoor projects. We have seasonal projects. For a list of what we hope to accomplish this year, click here. the Nubians tend to each take a side and chase the Kinders else away. The beauty of a routine is that once I walk out the door, the rest is set in motion. There's no pondering what to do next, decisions to make along the way, or trying to remember if I forgot anything. I make mental notes of things that will need tending to later, but by the time I'm done, I know the essentials of the day are taken care of. How about you? Do you have a well-established routine or are you more spontaneous in your approach? Still experimenting? What are your favorite chores? Any tips and advice for the rest of us? With every eBook I write I learn a lot. It's not that I don't already have a basic grasp of the subject matter, but as I seek to research and collect the most relevant information, I either find missing pieces to my own puzzle to understanding, or somehow the bigger picture becomes clearer. This newest book in the series is no exception. How to Mix Feed Rations With The Pearson Square: grains, calcium, phosphorous, balance, & more. What is the Pearson Square? Why Mix Your Own Feed Rations? But Is It Cost Effective? It's available for $1.99 at Amazon for Kindle, and at Smashwords for all eReaders including PDF for reading on your computer. Today and tomorrow you can get it for free(!) at Smashwords with the code (expired). Enter the code at checkout and select the format you prefer (epub, mobi, pdf, rtf, lrf, pdb, txt, or html). I'd also like to mention that with each new eBook I publish, I update the others. This is to keep the series titles and links up-to-date, but it also lets me make corrections (thanks Anna!) or updates on information. I'm not sure about Amazon, but at Smashwords, once you've purchased a book the updates are available as part of the purchase price. 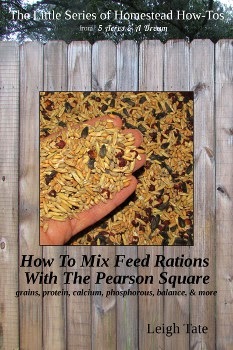 The webpage for How to Mix Feed Rations With The Pearson Square's is here, or you can visit the series' webpage here. As always, feedback and suggestions are welcome! Riley, the ordinarily non-cooperative, and Sam, the persistent. Two posts in one day! I can barely get one out every two or three days, but how can I not blog about the weather!? After kicking off November with a snow shower, December spoiled us with its springlike temps; during most afternoons we didn't even need a jacket or sweater outdoors. We did get a lot of rain, however, which meant the garden was too muddy to do anything with. That's why we got so much done on the front porch. Now everything is frozen solid. We only got down to 10° F / -12 ° C last night, so I suppose I shouldn't complain. Sam's got the right idea, don't you think? 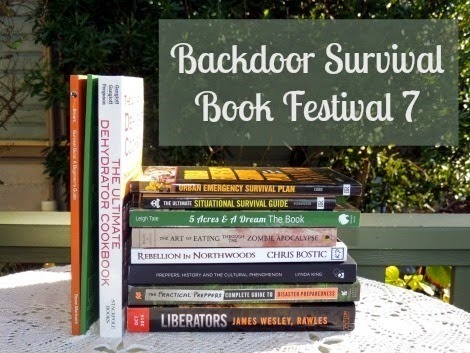 I have been invited to participate in Gaye Levy's Backdoor Survival Book Festival Number 7. 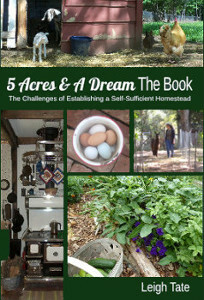 Today I'll be featured on her website in an author interview, and readers will have a chance to win a free copy of my book, 5 Acres & A Dream The Book: The Challenges of Establishing a Self-Sufficient Homestead. Please head on over and check it out! Here's wishing everyone a very blessed 2015. As is our custom, we did not stay up till midnight. Nor do we make resolutions. Instead, we made goals. They are much more flexible than resolutions and more useful! Here are ours for the upcoming year. House - finish the front porch. We accomplished quite a bit last year but still have a way to go. Up next will be replacing all the old windows with energy efficient ones; both those in the living room and the front bedroom. Then we can put up the new siding. Still under contemplation is replacing the porch ceiling. Finishing touches will be staining the decking and painting exterior, door, and trim. Barn - the new goat barn still seems impossibly unattainable, but if we take it one step at a time we may eventually get there. The one thing we have definite plans to do is the branch removal I mentioned. Anything more depends on how far we get with the front porch. Fences - this one makes the goal list every year because there is always something to fence, or there are fencing repairs to be made! There are several things we are hoping to focus on this year. Gates - we have three gates needing to be installed: two in for the garden and one at the bottom of the doe browse. Doubled fences for protected diversity - the idea here is to run a second fence about 4 to 6 feet parallel to existing fences. 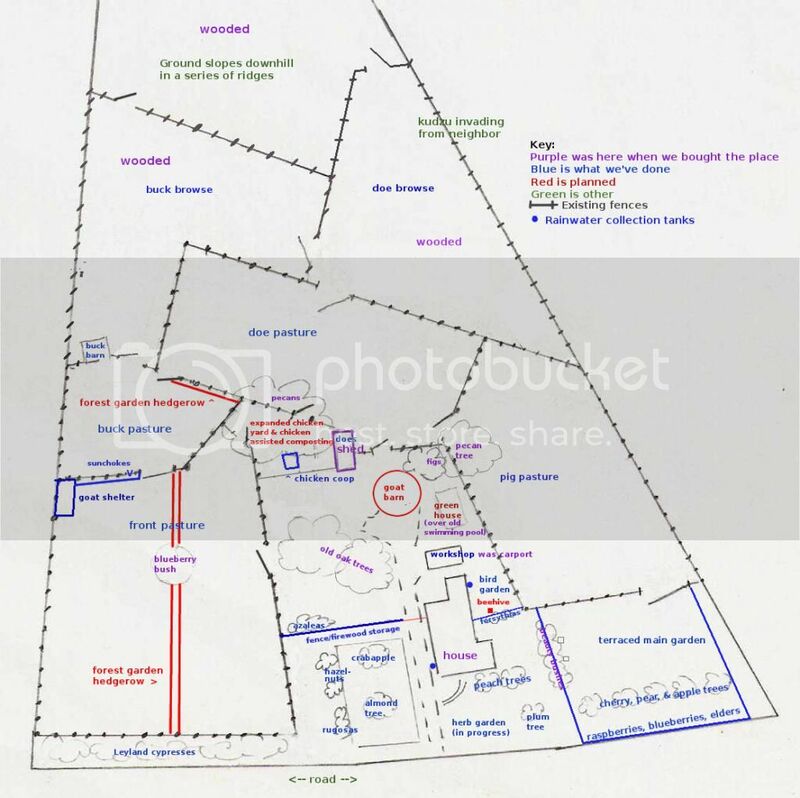 In between I plan to plant a perennial forest garden of fruit trees, shrubs, herbs, perennials, etc., that will help feed the chickens, pigs, and goats. Goats in particular will demolish things they like, but this way I hope they can gain nutritional benefit without destroying what I've planted. More on this soon. We'd like for the goats and pigs to forage more in our wooded area. There are so many downed trees back there, however, that fencing would be difficult. We're considering setting up cattle panels to let them into the most accessible areas. The beauty of cattle panels is that they can be tied to trees for a temporary fence, but moved easily as required. Goats - Kinders only. Our days of different breeds and different sizes are about over. I tolerated the Nubians while trying to make Kikobians and Kinders, but they really aren't for us. Both Dan and I prefer the Kinder personality so much more. This also means Gruffy will need a new home, but I honestly think he'd be happier with goats his own Pygmy size. I know he gets tired of being picked on by all the bigger bucks. Pigs - 2014 was our learning year for pigs. Not that we have it all figured out, but we've seen how useful they can be in preparing the soil. 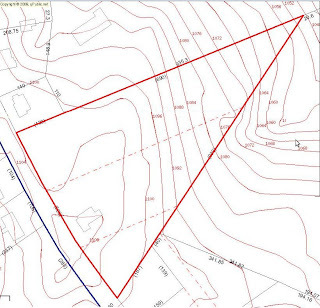 It confirms my original plan of rotating pigs, field crops, and pasture as part of our land stewardship cycle. Also, we should get baby pigs this year, which makes Dan happy 'cuz he loves his bacon and sausage. Field Crops - Now that we have the pigs to help, we're hopefully looking at not having to plow anymore. At the most, the clay clods may need to be disced and the area dragged to make it smooth enough for the scythe or sickle mower. In addition to wheat and corn, I want to add root crops for field growing. Turnips and mangels or sugar beets in particular for the livestock, especially as I get away from grain for the goats. Chickens - the chickens should really be able follow the pigs around. The pigs turn the soil, through which chickens love to scratch. Plus, they both need to be kept out of areas that are newly planted. We need a better gating system for this, however, so that we can direct the chickens to wherever the pigs are. 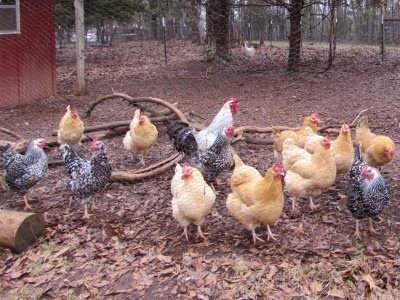 For this we plan to expand the chicken yard, which will also facilitate expanding our chicken aided composting, another experiment we are pleased with. Honeybees - I have my first hive and bees are ordered! More on that soon. How about you? What plans do you have for the upcoming year?